Going to see your kids/nephew/neighbour’s kids perform in an orchestral recital is usually the kind of dutiful task you undertake with a forced smile as you warm yourself with a sense of your own virtue.Soft Touch’s Symphonise project smashes all such feelings out of the park by being a glorious celebration of the possibilities of music and creation – a genuinely uplifting experience for all concerned. 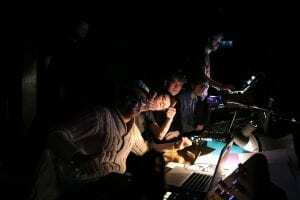 This January saw the third running of this project run jointly between Soft Touch and Leicester Philharmonia Orchestra. Once again it saw musicians and arts workers from Soft Touch join with orchestra players to lead young people from The Lancaster School, Winstanley Community College and The Highfields Centre in creating musical pieces that fused classical music with reggae, dub, spoken word and other urban genres. These were not your average Grade 4 cello students – nearly all of the young people had never picked up an instrument before. 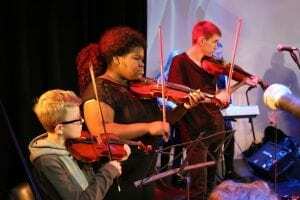 After a series of taster session a group formed that committed to an intensive three-day period creating three concerto pieces that reflected some of the ideas of Hungarian composer Bela Bartok around the whole orchestra being the soloist. This culminated in a performance at the Sue Townsend Theatre (remembered of course by Leicester people of a certain age as the original Phoenix). From the opening spoken word address it was clear we were in for a real roller coaster. 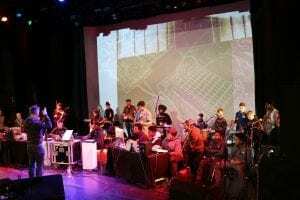 There was a highly diverse group of around 30 participants on stage – rappers, singers, brass section, string section, drummers, guitarist and a range of young people doing live creative stuff with computers. At the back of the theatre a few more were making dramatic visuals, projected behind the performers, which illustrated and amplified themes in the music. At times it was slow and thoughtful, at times it sped up dramatically. The ebb and flow was choreographed by Philharmonia’s leader Jason Rowland who’s low-key but assertive conducting kept everything on track. The music – from the parping brass to the elegant strings and the smooth flow of the rappers – was melodic, insistent and memorable. Many of the audience would have been singing the closing mantra of “That’s what makes me Me!” for the rest of the night. 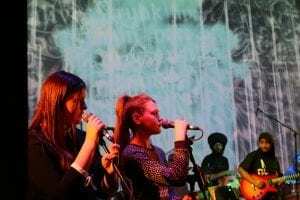 Though the music stood up for itself 100per cent, there was of course a wider dynamic at play reflecting Soft Touch’s wider work with young people. While their achievement was extraordinary, obviously not all the playing from young people was perfect – some mistakes were made. But the performance was underpinned by some highly talented adult performers – meaning the young people were able to test themselves, learn, make errors but achieve something remarkable in a safe, supportive environment. 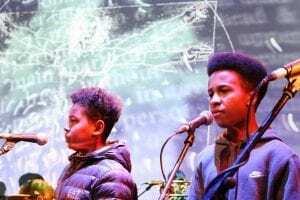 The parallel to Soft Touch’s wider aims of using the arts to support young people to overcome barriers and achieve in their lives screams out. The joy, pride and satisfaction evident at the end, even from the too-cool-for-school Apple mac guys was a pleasure to behold. Everyone should get these kind of opportunities.